Portable speakers are a norm these days. Besides compatibility and versatility that allows you to take it anywhere, what matters the most is the sound quality. The kind that delivers crystal-clear audio and vocal performances as well as powerful bass without all the muddying noises. That said, here are the 9 portable bass speakers worth investing for. Who says you can’t have good things even if you’re on a budget? With Anker Soundcore 2, this affordable portable speaker offers you a combination of crisp sound quality and punchy bass, thanks to its dual neodymium drivers and BassUp technology. If that’s not enough, the speaker is also blessed with an IPX5-rated design, meaning it can withstand elements like rain, dust and low-pressure water splashes. And did we mention that it has an ample battery life that can survive up to 24 hours of continuous music playback? Not bad for such a speaker at this price point. This JBL Xtreme 2 is more than just a medium-sized portable speaker with a minimalist design that looks aesthetically pleasing. It packs plenty of depth in its overall bass and sound clarity, thanks to JBL’s dual passive radiators located on both sides of the speaker. The speaker also has a built-in 10,000mAh battery that can last up to 15 hours of continuous music playback. Other highlights include the speaker’s IPX7-rated design that is both splash-proof and can withstand water immersion of over 3 feet. Words like “loud”, “punchy” and “deep” are best described for this boombox-style portable speaker. Whether you are listening to jazz or even a rock song, the speaker delivers a crisp sound quality that is both crystal-clear and distinct. And those are all thanks to JBL’s dual bass radiators and four active transducers. The JBL Boombox is also IPX7-rated, making it durable enough against minor rain and water splashes. Not to mention it packs a huge 20,000mAh battery capacity that allows you to play your favourite music continuously for up to 24 hours. 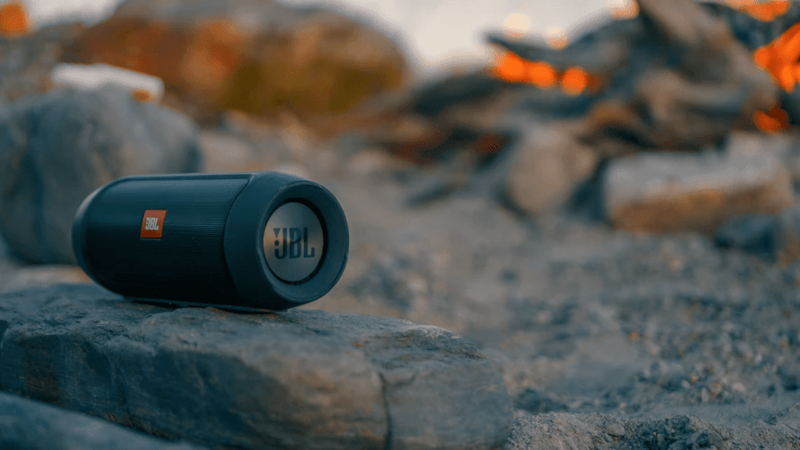 JBL is no stranger to producing a range of portable Bluetooth speakers and that includes their Charge 3 model. It packs two passive radiators that offer incredible sound and bass performances. The long-lasting battery life of up to 20 hours also allows one to play wirelessly for as far as 30 feet, thanks to its Bluetooth 3.0 connectivity. The JBL Charge 3 is blessed with a waterproof design, making it safe enough to take with you on water excursions. At 0.8 kg, it is a tad weighty for a portable speaker but at least it has plenty of goodies that manages to outweigh its cons. Big on sound and small in size, that’s pretty much the Anker Soundcore Mini which carries a mere weight of 0.24 kg. Built with a combination of 5W active driver and passive subwoofer, the speaker produce surprisingly crisp sound and bass quality with almost distortion-free noises. Other features include Bluetooth 4.0 connectivity, various playback options (aux input, a microSD slot and an FM radio) and a durable battery life that can last up to 15 hours. The Anker Soundcore Mini also comes with a built-in microphone, allowing you to answer phone calls using the speaker itself. Here is another quality product from JBL, featuring everything you need for a portable speaker. It boasts a Bluetooth 4.2 connectivity that allows you to connect with not one but two mobile devices. The speaker also has reasonably good sound quality regardless of playing rock or pop music. Other highlights to love includes the IPX7-rated waterproof design and a 3,000mAh battery capacity, which is said to be able to last up to 12 hours of continuous use. The Sony SRS-XB41 features the company’s Extra Bass technology, which helps enhance the bass and rhythmic sound of your music. Despite the size, it manages to play loudly with the help of the speaker’s dual 58 mm drivers. At the back of the speaker, you will find plenty of inputs and outputs located underneath the flap such as a 3.5mm input and a USB output. The speaker also packs a Bluetooth 4.2 connectivity and an incredible battery life that will last 24 hours. Some portable speakers are ideal enough for indoor listening pleasure but not for outdoor purposes. Fortunately, UE (Ultimate Ears) Megaboom allows you to blast your music (almost) worry-free with its IPX7-rated waterproof design, perfect for nearly any outdoor setting. As for the sound quality, the speaker gives it all with its dual 2-inch active drivers and two oval-shaped passive radiators. So, enjoy robust bass responses which is capable of generating an immersive 360-degree audio experience. The 20-hour battery life is just as great, while its strong Bluetooth connectivity is able to stretch wirelessly of up to 100 feet. Whether you are looking to pump up the music for your birthday or poolside party, you can count on JBL Pulse 3 to deliver the goods. The speaker is capable of producing a 360-degree sound, making it ideal enough for the outdoor setting. There’s also the unique exterior design that houses a built-in LED lighting panel. All you need to do is link the speaker using the JBL Connect+ app, which allows you to select different cool light settings such as Wave, Jet and Rave. Think of it as a mini light show that makes your parties all the more fun and exciting.